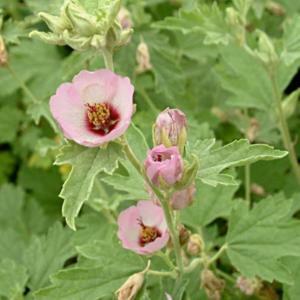 Mallow-like, pale lavender flowers with a dark eye, in mid to late summer. Soft grey green leaves and an erect, subshrubby habit. Rich, well drained, gravely soil in a sunny sheltered location. Dislikes excessive winter wet. From seed, will usually flower in its first year. Raised by Hopleys nursery, Hertfordshire, UK..